One sunny morning we took the train from Lucca to Florence. 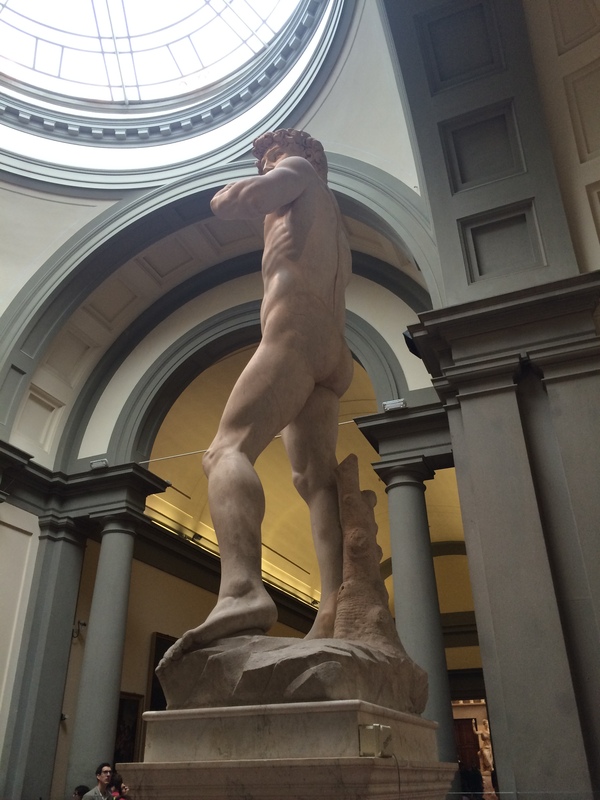 We had plans to visit the Galleria dell’Accademi a and lay eyes on Michelangelo’s David. The gallery was within walking distance of the train station. The lines of tourists were out the door and around the block in both directions. Fortunately, my sister had the foresight to purchase tickets in advance. We waited in a short line to get our tickets, then scooted in past the spontaneous folks. After going through airport-like security (courtesy of that man with the hammer) we wandered in and saw HIM. David is 14 feet tall. I didn’t expect that for some reason. He is lovely. I circled the stature for 20 minutes or more (probably with my mouth hanging open) and I don’t really recall any of the art we passed as we approached HIM. One thing I did notice immediately was his right hand. It is oddly out of proportion to the rest of him. At the t ime Michelangelo carved David from Cararra marble in the early 16th century, Florence was independent but being threatened from all sides. It’s said that David’s eyes were meant to send a strong message to Rome. I read one article in which the author stated David’s the furrowed brow was proof that David was about to fight Goliath. David stood outdoors for almost 300 years. He was moved into the Galleria in Florence in 1873. What the heck? I liken that to buying a Ferrari and leaving it parked in the street. David is breathtakingly stunning from all angles, big right hand and all. It blew my mind that someone carved this from a hunk of marble over nearly three years. The marble is so perfect and the lines of the man so defined; even the veins in David’s arms are there. If you ever have a chance to visit Firenza, get your ticket online ahead of time and spend an hour with David. Make sure you turn left at David and visit the room full of carved busts and statues. Time well spent. Thanks for bringing back some lovely memories. Agreed that David is both miknd-blowing in its creatin and staggering in its beauty.